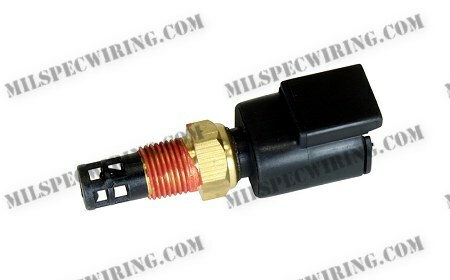 The RG.SN.5012 is an NTC (Negative temperature coefficient) temperature sensor. The resistance of the sensor element decreases with increasing air temperature. It is designed to be used in air and is not recommended to be used for fluid temperature. It is an unpowered sensor and therefore requires that the input line is pulled up, so that the resistance change will result in a voltage drop in the input pin. It is generally recommended to connect the sensor to an AT input on a MoTeC device, as these inputs include a 1kΩ pullup to 5V. The voltage information below is provided assuming the sensor is setup on an input including a 1kΩ pullup resistor to 5V. If this is not the case, then the resistance row must be used to calibrate the sensor instead.